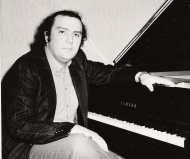 Mikhail FAERMAN gave first some recitals in ex-USSR as well as in Bulgaria. In the 1980’s, he gave recitals and concerts including TV shows in several cities in Germany (Berlin, Munich, Bremen, Dortmund, Bayreuth, Nuremberg, Lübeck, Hof, Saarsbrücken, Koblenz, Baden-Baden). During this time, he also travelled the world to give concerts in Canada, France (at the prestigious Châtelet Hall in Paris with orchestra in 1982), took part to the Como Festival in Italy, and in Murcia (Spain). In The Netherlands, he was radioed by Hilversum at the Concertgebouw in Amsterdam and in Great-Britain by the BBC in London. In 1985, he was invited to the International Festival of Seoul in South Korea to play a piano recital as well as a concert with orchestra. In Belgium, where he lives now, he has given several concerts in Antwerp, Liege, Spa (among others with the Philharmonic Orchestra of Liege, conducted by Pierre Bartholomee) and in Brussels. Mikhail FAERMAN gave several charity concerts to benefit Amnesty International, the Rotary Club as well as to other famous institutions.